There were disproportionately too few techies in last year’s survey mix. We need to get the word out to developers and development managers and UX designers to join the other members of product teams to ensure teams are fully represented. Participate in the 2013 Study! As for those five factors, you can download all of last year’s study (including some of the comments behind the data). Fascinating study! I went to the website to see the research and found that the study was advertised as “Available for FREE Download”, but actually they charge $19.95 for it. 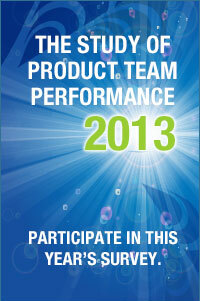 The Study of Product Team Performance, 2012 conducted by Actuation Consulting, LLC. and Enterprise Agility, Inc. sponsored by Accept Software is now available for download free. The study found five key factors, that if in place can have a product team performing at the highest level of achievement but when absent, a product team’s performance can drop to 2%. Thanks, Kimberly. It’s free from the link to Actuation’s site in my blog above. A couple of last year’s nonprofit sponsors (asapm one of them) had dispensation to re-coup their costs with a small charge, but those were supposed to be complete months ago. I’ll ask Greg to prompt the sponsors to get with the program. In the meantime, just fill out the form at the link in the blog, http://www.actuationconsultingllc.com/whitepaper_request.php for your free copy, ok?